And...? I don't think Fr. 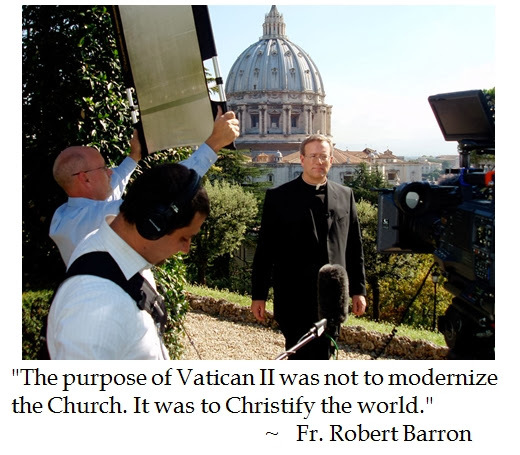 Barron knows what the purpose of Vatican II was, obviously. Traverseenvie Have you read the Documents of Vatican II to bolster your "obvious" criticism. Pope (Emeritus) Benedict XVI encouraged the faithful during the Year of Faith to read the four constitutions, nine decrees, and three declarations promulgated during the Second Vatican Council as well as attending academic discussions to discern what were the true fruits of V-II. The debate which animated the Pope Emeritus is whether there was a hermeneutic of continuity or a hermeneutic of rupture. What is your "obvious" answer?